This Business Card Punch Out Picture Frame Magnet makes great giveaways for insurance agencies and at trade show booths. Dimensions: 5.25 " x 3.75 " x .01 "
Advertise your brand services, in a memorable and economical way, with the Business Card Punch Out Picture Frame Magnet. 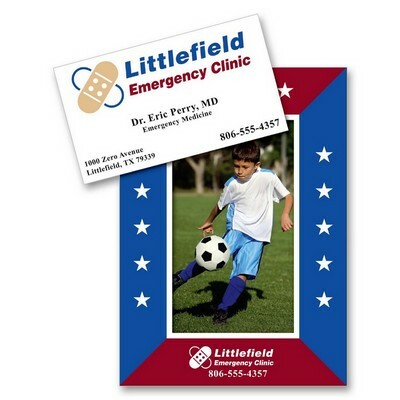 It features a punch-out center that functions as a 2 x 3 1/2" business card. This eco-friendly magnet is a by-product of iron oxide created during the steel making process, and therefore, recycled material. These magnets are ideal for promoting new businesses, such as, a construction business or a photography studio. They also make great giveaways for insurance agencies and at trade show booths. Add your company’s logo and message on the picture frame magnet and draw in the intended market for your brand.